As our time in China was slightly more limited than in Thailand and Vietnam, it’s been a case of seeing as much as possible in as little time as possible. After crossing the border from Hong Kong to Shenzhen (where I was nearly refused entry once more – who gives a 16 year old kid a 10 year passport?!) we decided to save some time and fly up to Xi’an the next day. As is often the case with my travels, I had a very basic knowledge of our next destination aside from one thing: the Terracotta Warriors. The Terracotta Army is a collection of soldiers and horses that were individually crafted and, as such, each have their own unique facial features, hairstyles and so on. 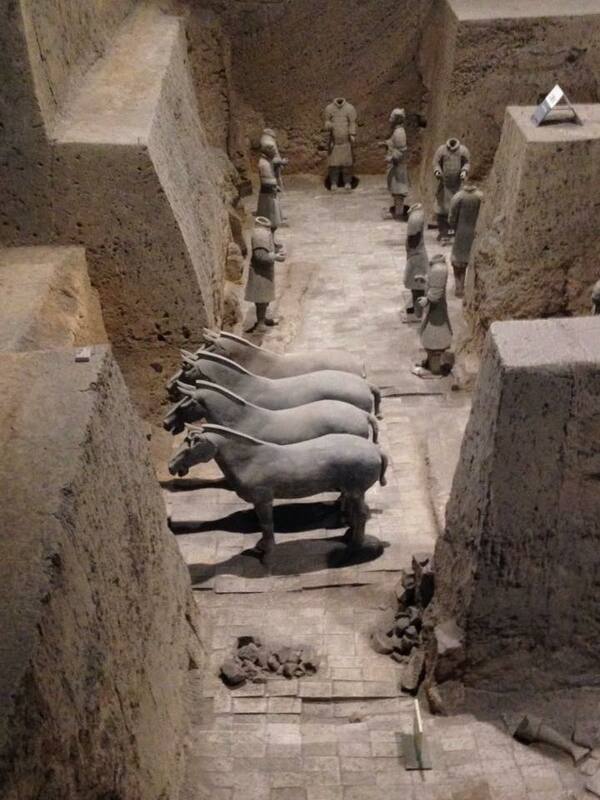 Building work supposedly began in 246 BCE during Emperor Qin’s reign and involved around 700,000 – if not more – workers. They were found by a farmer digging for a well in the 1970s and have since been partly restored in their original places. More warriors are being discovered to this day and the digging is expected to go on for quite some time although obviously not by the original farmer, as he’s probably far too old and rich to give a toss any more. As you can see, the characteristics on the faces were unique for each warrior. We opted to visit the warriors ourselves as an organised tour doesn’t really offer much flexibility. I enjoy being able to come and go when I please, as well as saving a few Yuan in the process (same story, different currency) so we jumped on the 603 bus to the railway station and the 306 bus to the warriors which didn’t get confusing at any point at all. In total the journey probably took around an hour and a half which, for less than a quid, wasn’t too bad. Upon arriving at the warriors, we were greeted by dozens of street vendors trying to sell us food, mini warriors, a guided tour and just about everything else they could get their hands on – we politely declined and moved on. We were told to look for the big KFC to find the ticket office, which I’m sure you’ll agree is a lovely presence at a national heritage site. We were approached by a number of official (and unofficial) tour guides but we opted against their services and we seemed to do ok. The fact I’ve had to Wikipedia all the facts about the warriors since we visited is completely irrelevant…honest. As you may have gathered recently, I’ve been having a few problems with forms of identification or – more to the point – my passport. ID woes were to follow us to the Terracotta Warriors too, as we found out that student card holders are entitled to a 50% discount on their tickets. Unfortunately for James and I, our student days are well behind us but our new friend Xabi managed to save himself a cool 75 yuan. Now, I’ve not been a student since 2011 so I can’t really complain, but maybe it’s time to invest in a new fake ID the next time I find myself on Khao San Road. The warriors are kept in three pits extremely close to each other. As I said, there’s still plenty of digging going on so I imagine this number will continue to grow for years, Having spoken to a few people who had visited the warriors before us, we decided to tackle the pits in a slightly roundabout order, going to number two first, then three and ending on pit one. As is often the case, the photos can do the talking. This turned out to be the right thing to do, as pits two and three were fairly impressive but contained a lot of empty space or smashed warriors. I dread to think what happened to the clumsy sod who did that sort of damage whilst digging – rather him than me! Pit one, however, was worth the entrance fee alone. 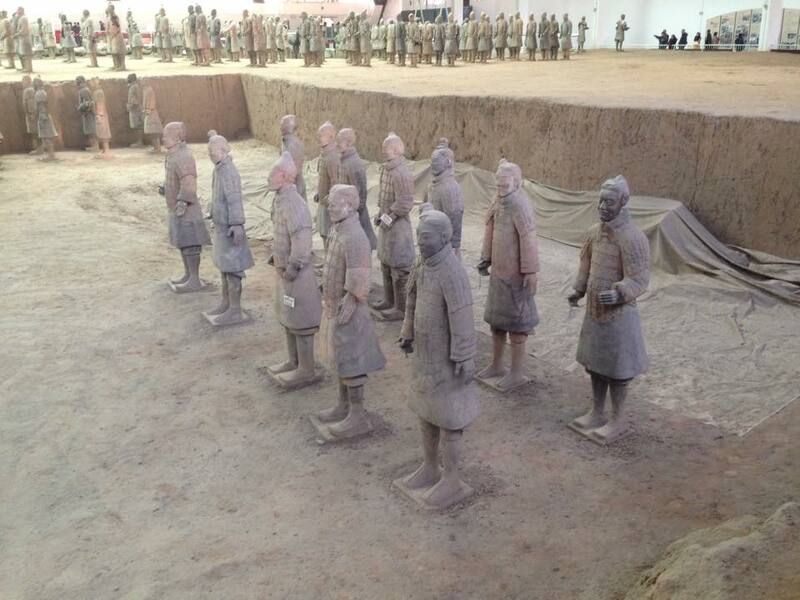 Pit one is where the warriors were initially found, and contains the largest number of sculptures. Whilst there are (expectedly) a few damaged ones, they remain largely intact and it is a truly impressive sight. I managed to fend off the huge tour groups and push to the front for a few pictures myself, which I think will give you an idea of the warriors better than my words ever could. Pit one really had to be seen to be believed! It was interesting to see the exact spot too where the well was being dug when they stumbled upon the warriors. Imagine that! Rocking up to work one day thinking you’re just doing the standard digging for a well and walking away at the end of the day having discovered something as huge as this. It’s really quite bizarre to think that just 40 years ago, this was probably empty land where no one had any idea about what lay underneath. Anyone fancy getting the shovels out?